Some folks find it hard to take the .380 ACP seriously since many .380s are inexpensive pocket pistols. On the other end of the scale, full-size 1911s are hard to conceal. What if you could have the best of both worlds? The 1911-380 Black Label from Browning is a line of functional, 85-percent-scale, 1911-platform handguns chambered in .380 ACP. Unlike the several 1911-style miniatures on the market, it is a “real” 1911, one that mostly functions and handles like the original .45 ACP. I took on a copy of the Black Label Medallion Pro Compact for testing. As a compact, it’s the Commander-size version of the series, with a barrel of just 35/8 inches. The full size 1911-380s have 4.25-inch barrels. This little dandy is carry-friendly thanks to a light, 7075 aluminum frame and composite trigger guard. The stainless-steel barrel has a target-style crown. Overall, the length is 67/8 inches, and the sight radius is 4.75 inches. It comes with two eight-round magazines. Unloaded, the weight is a featherlight 16 ounces. The tritium-enhanced combat sights are excellent, with a bar-and dot layout that makes it easy to acquire the sights in low-light conditions. White-dot combat sights are standard, with the rear adjustable for windage. My test sample was the model with optional tritium combat sights. They’re good-looking in daylight and easy to use in the dark. 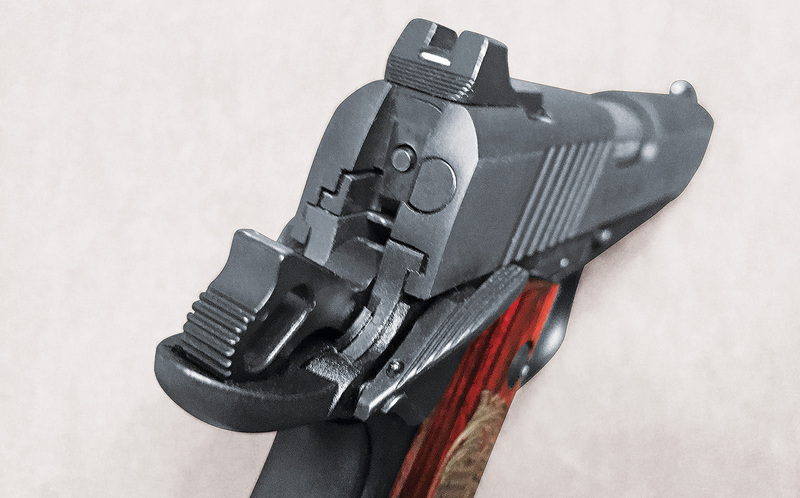 Sight alignment is unmistakable, with a horizontal rear sight bar and a dot up front. 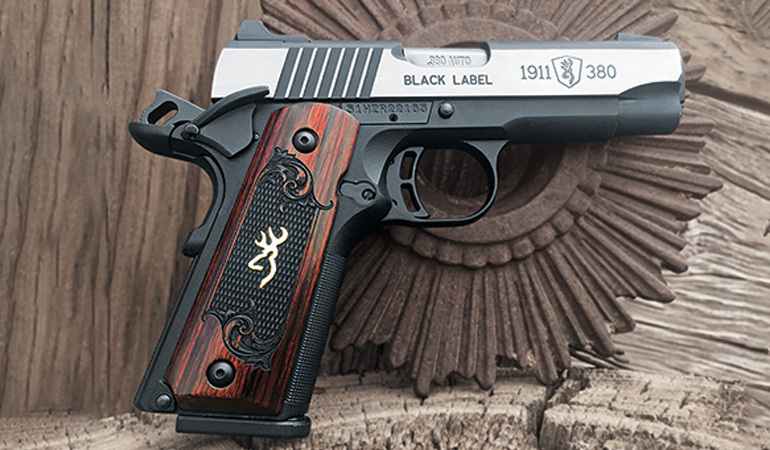 It’s concealable, yes, but Browning also blessed the Black Label Medallion Pro Compact in the looks department. The polished stainless slide is boldly emblazoned with the Browning Buckmark and the model name. Its shine is in striking contrast to the matte black frame, shiny rosewood grips, and the gold-tone inlaid buck logo on the grips. Traditional, molded checkering on the frontstrap, backstrap and button of the grip safety is flawless in appearance and aids in traction. The slide lock is generously long, but within traditional dimensions, and the thumb safety is ambidextrous. The trigger has two cutouts, lending a skeletonized look that saves on weight. Racking the slide is deliciously smooth and easy. Recoil spring tension on racking is so slight that I first questioned whether the slide would cycle reliably. I need not have worried. Shooting the Medallion Pro Compact is a joy. The little gun ran every brand of ammo without a hiccup, and for a compact .380, it can run with the big boys in terms of accuracy. Trigger operation is typical for a 1911 platform, with approximately 0.20 inch of travel to a clean break and a short trip back to reset. Small as it is, it allows for serious shooting. All the standard controls you’ll find on a “normal” 1911 you’ll find on this gun. 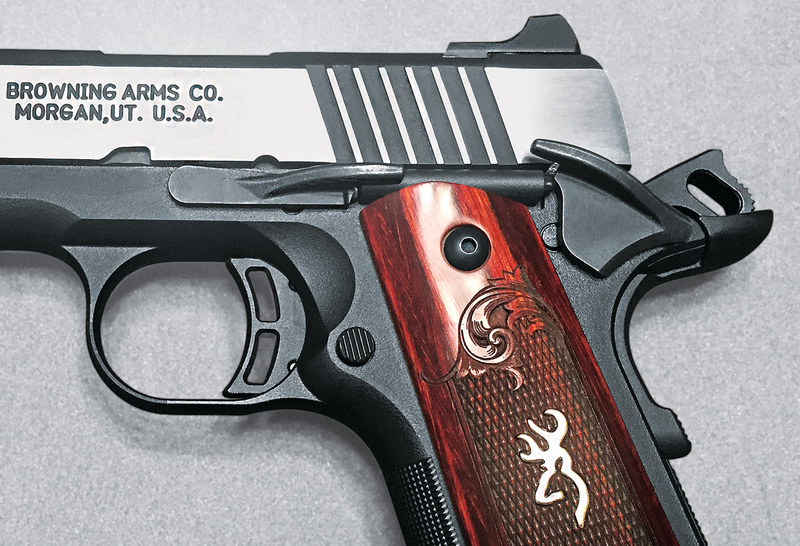 The rosewood grips, Browning logo and contrasting frame/slide make it a real looker. The pistol has a flat mainspring housing and grip panels. This slimmer profile enhances both concealability and ease of handling. Thanks to this and the .380 ACP cartridge, felt recoil is minimal. In comparison to other mock 1911s in .380, this one’s extremely manageable and more conducive to fast follow-up shots. My indoctrination to 1911 operation, which includes Gunsite Academy, says the firing-hand thumb rests atop the thumb safety during firing, to prevent unintentional safety engagement. With my thumb in that position, my rather hollow palms don’t sufficiently depress the grip safety. This I resolve by employing a customary two-thumbs forward grip without the thumb above the slide safety. Browning 1911-380s have a magazine disconnect and can’t be dry-fired without a mag inserted. In my opinion, a gun that’s likely to end up in the hands of a new shooter, due to its size and manageable recoil, should allow easy dry-fire practice. While you can’t go through every manipulation due to the mag disconnect, there’s no warning against dry-firing in the owner’s manual. Many generic holsters fit the Medallion Pro Compact, but it really deserves a custom container. 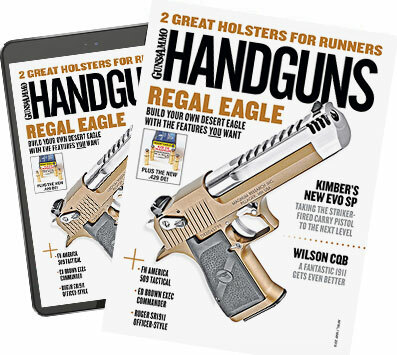 Browning offers its own selection of inside-the-waistband and outside-the-waistband leather and OWB Kydex holsters for 1911-380 pistols, with no apparent distinction between full and compact barrel lengths. Experienced and beginner shooters alike will find a lot to love in the Browning Black Label Medallion Pro Compact. It’s pleasing to look at, pleasing to operate and reliable. Suggested retail price for the model shown is $800, but you’ll find it for less at most gun shops. It’s now easier to conceal a 1911. Problem is, this one’s so good-looking, it will be hard to keep it under wraps.